Innovative luxurious Layout with many Features! Add DrumKits to your Layout. Enter the Title for your featured Drum Kit ( Box Image shown on the Layout ). 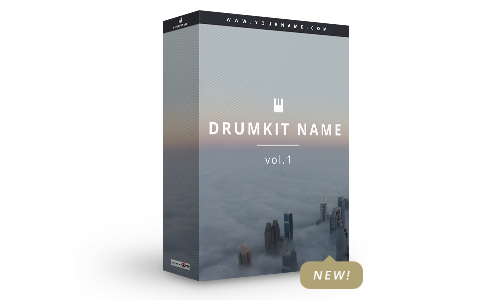 Upload your own featured DrumKit Box Image as a .PNG or .PSD file below. Premade Soundclick Layout 059 with a clean luxury Design and many features. Light Colors like white blue and gold mixed. Use a small premade textbased Midi Keys Logo or upload your own (Layout Addons Tab). The Navigation will stay at the top of the Page when scrolling down. Clicking on a Menu Tab will scroll the Page to the Content. The Header part contains the Page and Song Play Stats, “Website” and “Social” Buttons and a News Box which can be easy updated at your Soundclick Band Admin area. Main focus is on the Instant Beat Store (MyflashStore.net) right below the MP3 Beat Player and manual Paypal Checkout. The Instant Store is including Instructions and mobile Link. 4 Terms Boxes are available including Headline, Price and Info Text. The Contact Form let your Customers send your a Text to your Email right form your Soundclick Page. Next to it the Spot where you are able to sell your DrumKits! Below the Mixing Service Info your Customers will be able to sign up to your Mailing List of Mailchimp, Aweber or any other Host. The latest Youtube Video can show one Video, Playlist or a User Channel. The extended Production Catalog has been redesigned to a new innovative look with new Buttons. At the Footer you will find a small text about your Page, a small Mailing List Sign up, a Mobile Beat Store Link and some Logos.